My daughter is going to be a ballerina for Halloween. I found the tutorial to make her tutu here. 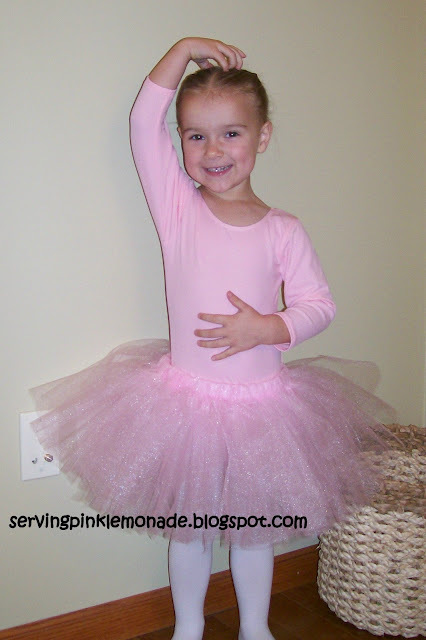 It's a very simple no-sew tutu that can be made in probably 30 minutes to an hour. All you need is some elastic and a few yards of tulle. They could make darling Christmas presents for your daughter, niece, grand-daughter. . . I'm really surprised she wants to be a ballerina! She's awfully cute... one day I'll have a girl I can make a tutu for. This is such a cute tutu and so easy to make. It is a lot easier than the one I made for you girls when you were little.